Solos by Hodworks (Hungary) is a joyful, carefully crafted hour by Adrienn Hod with three exquisite performers (Emese Cuhorka, Csaba Molnar and Imre Vass). Hod has created a Generation Game prize belt of ever changing 4-6 minute solo choreographic scenes for an audience in the round. With each scene chained together by the end/start level of emotional intensity it’s an interesting way to view the range and versatility of the performers alongside the dozen or more miniature ideas that Hod wants to explore wrapped in a faux-fur creature singing big numbers from Cats and Disney classics, a gentle lingering hug for a single audience member, a hyper-inflated word stream outlining the trouble of the choreographic process or a sweet pepper eating trial. Solossits well in the late night cabaret slot of Tanzmesse and adds to the reputation of both Hod and Hodworks. Crépuscule des Océans by Daniel Leveillé Danse (Canada) self describes as ‘a human tide, animated by opposing currents: busy, but at the same time on guard — concentrated to make no mistakes — resistant, ambitious and obsessive.’ The reality is a woeful 55 minutes in the 1200-seater Capitol Theatre of seven dancers, naked for 70% of the time, pairing up in small areas of the stage to repeat the same 8 minutes of out-of-time tippytoe-tensing, 80s-lungeing-with-pointy-fingers choreography to piano music by Jean-Sébastien Durocher. Heralded in the 1990s as the Canadian pioneer of presenting the unclothed body on stage, Leveillé’s concept or choreography appears not to have changed since; how ironic to be presenting this 11-year-old work on Jaenicke’s first program of ‘change’. As Crépuscule des Océans lurches on, one dancer makes three clear mistakes, forgetting the choreography and freezing in one group section and making two large stumbles elsewhere; as the audience leaves after a smattering of slow claps, there is angry talk of wasted time, the mistakes and the possibility of what could have been experienced on stage instead. There is a suite of talks each day with one entitled The Future of Performing Arts Market featuring Sophie Travers (APAM), Jaenicke (Tanzmesse), Asa Richardsdottir (Ice Hot) and Alain Paré (Cinars): four current performing arts markets talking about their future? Unsurprisingly there is no real sense of what the future might look like because the speakers have no desire to erase their own presence and with no input from anyone outside a performing arts market there is no alternative perspective; the master’s tools will never dismantle the master’s house. If the purpose of these events (the majority of which are still replicating near 30-year-old models) is to act as a meeting point, to stimulate new relationships and to ‘offer more space for communication, exchange and contact’ then we need voices from outside (in both programming and construction) to widen possibilities and ensure representation and intersectionality are considered at the centre of future editions. In the Women’s Voices in Choreography talk, chair Andrea Snyder from American Dance Abroad highlighted the percentage of women represented in each part of the programme; it’s around a third. For every two performances or pitches by a male in the biggest dance trade fair in the world there is one by a female. This is unacceptable. Insightful contributions from the floor by Emma-Jayne Park (Scotland) and Annabelle Guérédrat (Martinique) as well as by Christine Bonansea (USA) on the panel are counterbalanced with some eyebrow-raising talk from other women in the room on how ‘women lack ambition and lack the ability to be strategic.’ There is a call for a consistent sisterhood that does not keep cutting each other down and a clear call for action in the Tanzmesse evaluation where we should demand an equal number of performances and programming slots for women as a minimum in future editions. Alongside the talks programme there are some fifty 20-minute open studio/pitching slots over the two days where artists can offer a flavour of something new that is coming down the pipeline to generate interest in future international touring or building co-production partnerships. Seeta Patel presents a polished 8-minute excerpt of her bharatanatyam reimagining of The Rite of Spring that will tour the UK with 6 dancers from May 2019 and scale up to the Sadler’s Wells main stage with 12 dancers in 2021. Group bharatanatyam is a rarity and it is refreshing to see the intricate patterns multiplied and echoed across many bodies as the power and collective sound of the jattis leave me wanting to see and hear more. HOPE HUNT & The Ascension into Lazarus (HHATAIL) by Oona Doherty blasts the dusty roof off Tanzmesse 2018 and if the rarely-heard decibel level of applause and the length of standing ovation are anything to go by, then the Belfast-based performer/choreographer is about to collect some serious air miles. With the audience starting out on the street, sardined on the narrow paths outside the FFT Kammerspiele, an ageing Volkswagen blaring 90s UK dance music screeches to a halt, the driver pops the boot and out onto the concrete night floor lands Doherty. As she discovers her Bambi legs and staggers into and out of the crowd, up and down the road, the audience begins to absorb her, spits her out and takes her back, in an exchange of energy that stays charged till the end. Dressed in three stripes, Shockwaves hair and gold-chained neck, Doherty screams at us to get inside into the black as we are about to witness ‘a man who is many men telling his story, a hunt for hope as we are twisted and contorted with ideas of masculinity, morality and nostaligia.’ With HHATAIL we are in the arc of an eruption; Doherty coughs and conjures up words, memories and choreographies that bite and nestle under the skin offering us a glimpse of an underclass, of Belfast and of a resistance. As we continue to see the repeated crunch of her body biting the floor it is her energy and performance that stains the mind. Injecting a fire and spirit into the audience against the relentless Tanzmesse schedule and the wearisome neoliberal politics of the West HHATAIL is testament to the quality of Doherty’s dramaturgy and performance. There is a growing presence of work made for non-theatrical spaces at Tanzmesse and a highlight of that programme is DISCOFOOT by CCN Ballet de Lorraine (Petter Jacobsson and Thomas Caley). Two teams of 11 classically-trained dancers in short short gold lamé shorts, play/perform football with a mirrored disco football to a bass-heavy disco soundtrack played over two 10-minute halves on a marked out 5-a-side pitch outside Forum with a referee, live DJ and a set of ice-dance judges marking their performance alongside goals scored. It’s an absolute hoot and demonstrates a rarely seen lighter side of large-scale ballet companies. Tackling via the splits, twerk grinding whilst holding the ball up and with elaborate simulation when a foul has been committed, all demonstrate a clear knowledge of football with a wry sense of the growing theatricalisation and entertainment arena in which football and dance sits. As a model it could be exported to other events; imagine at the UK Dance Showcase having a 5-a-side beach version of DISCOFOOT with Avant Garde Dance vs Ladd Light and Emberton or Russell Maliphant vs Barrowland Ballet. On the final day there is an addition of an ‘Urban Dance Art Day’ with a programme curated by Takao Baba at Welkunstzimmer presenting a conversation, Urban Dance Goes Theatre, and two 90-minute showcase blocks of works (in progress, excerpted, improvised) by the likes of The Ruggeds, Gladness, House as well as two 15-minute excerpts of longer works, Between Tiny Cities រវាងទីក្រុងតូច by Nick Power and Tangle by Kinetic Art. Presented on the classic taped b-boy cardboard floor we’re offered a series of quarter-baked ideas and a poor sound system so we’re unable to hear the names of performers and what the works are about. The only work to come out with any sense of quality, presentation or theatricality is Power’s: the audience is placed in a cypher, providing energy for the two b-boys (Erak Mith and Aaron Lim) as they skirt the edges, playfully mock the tropes of the genre and each other and fake and play like boxers in the ring sussing out their opponent before attempting to land the knockout blow/move. Nevertheless, presenting ‘Urban Dance Art Day’ in this context shortchanges the audience but more pertinently reveals an uneasy, ongoing attempt by presenters to box/shoehorn hip hop culture into existing theatrical conventions. With advisors Malco Oliveros, Christian Watty and Carolelinda Dickey, Jaenicke’s first Tanzmesse displays not only an embarrassing lack of female choreographers and performers across the performance and pitching programme, but a geographical exclusion of dance from vast tracts of the world like Africa, the Middle East and South/Central America. I have only written about a very small percentage of the programme and one of hundreds of possible routes through the event but until the gender and geographical bias is acknowledged and altered then Tanzmesse will continue to feel like a central meeting place in Europe where the elite wield their power, position and privilege and deepen the chasm between those who are here and those who are not. The program of this mixed bill by Company of Elders is made up of three short works interspersed with three films, two from the Sadler’s Wells Learning and Engagement team about the company and one featuring the 2016 video portrait by Jonathan Burrows, Matteo Fargion and Hugo Glendinning, of Betsy Field and Mary O’Mahony, both dancers in the company. What emerge from the first two films are two major themes in Company of Elders, social and artistic. This mixed bill shows unequivocally the social underpinning of the group of seventeen dancers who Sadler’s Wells describe rather patronizingly as ‘demonstrating the power of lifelong creativity and proving it is never too late to start dancing.’ What the program affirms less convincingly is the artistic vision that comes with the creation of works by numerous choreographers over the past 29 years. This year Seeta Patel, Adrienne Hart and Dickson Mbi still only scratch the surface of the artistic capability in these dancers. Is Sadler’s Wells using these choreographers to advertise ‘the power of lifelong creativity’ in their flagship over-60’s company or does it wish to see the company develop its artistic potential? What parameters dictate that all seventeen dancers have to appear on stage in each work, for example? When Field and O’Mahony appear in their filmed portrait, they are given the freedom to establish their identity within a proscribed frame, sitting at a table, and with a minimum of gestural means. What comes across is an artistic endeavor that highlights the two performers in a way the three stage performances do not. Patel, Hart and Mbi introduce short solos and duets to differentiate dancers from the crowd and some highlighting is achieved, either through text or gesture, but the group as social entity is what each performance seems to endorse. It is a shame, as the group will always be limited in its physical reach by what the weaker performers can do, just as in a younger company. The general effect of this kind of choreography as social organization is a romantic, stereotypical vision of what being older means: waving arms in a tight group is one of the tropes that turn up again and again. And why (except for Patel’s work) keep these seventeen individuals in brightly coloured t-shirts like children at a summer camp? Is it not possible to allow each performer to suggest a costume they treasure and work it into a performance? The resemblance of one performance to another suggests a ceiling of artistic decisions that governs Company of Elders. In what strata of society will you find such conformity among seventeen individuals? Only where it is imposed from the outside. There are attempts in this mixed bill to break up this conformity. Patel in her Fragments, Not Forgotten finds inspiration in potent individual memories and uses a variety of groupings and a differentiation of gesture to indicate a more organic approach. In her A Tentative Place of Holding Hart unites the goals of Company of Elders with the inspiration of Arakawa and Madeline Gins’ ‘reversible destiny’; she uses more intimate gestures, gets the dancers off the ground in partnering lifts and a hopping step, and finishes with a plucky group challenge to the audience. Mbi in his Abyss separates the men and has them popping in slow motion and stamping out rhythms while he coaxes the women to develop the power of their arms in a semi-circular gestural dance that borders on wild. You begin to see possibilities opening up. A newcomer to the company, Monica Duck, clearly has rhythm in her bones. Mbi knows it and let’s us enjoy her movement, but Duck too quickly withdraws into the surrounding group as if such natural ebullience is frowned upon. 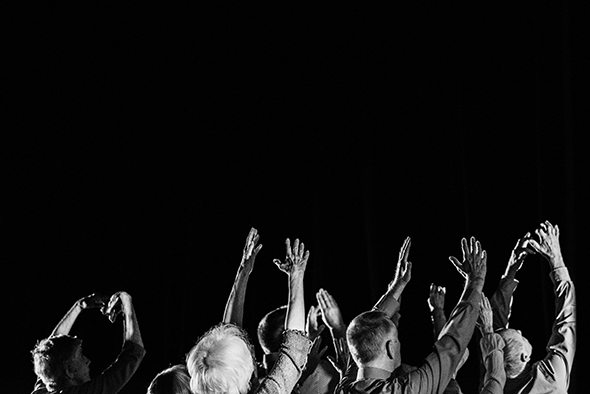 The employment of choreographers to create work on Company of Elders and to present that work on stage shifts its purpose in a parallel direction to its social benefits. The current mixed bill pushes the envelope of community dance closer towards the goal of artistic expression. If Sadler’s Wells is proud of their flagship company — and they should be — it is time to withhold the empty rhetoric of its Learning and Engagement team, stop patting itself on the back for presenting Company of Elders as bodies in a social ageing experiment and work towards bringing out the expressiveness of age as an artistic virtue. They might even consider paying them as artists. 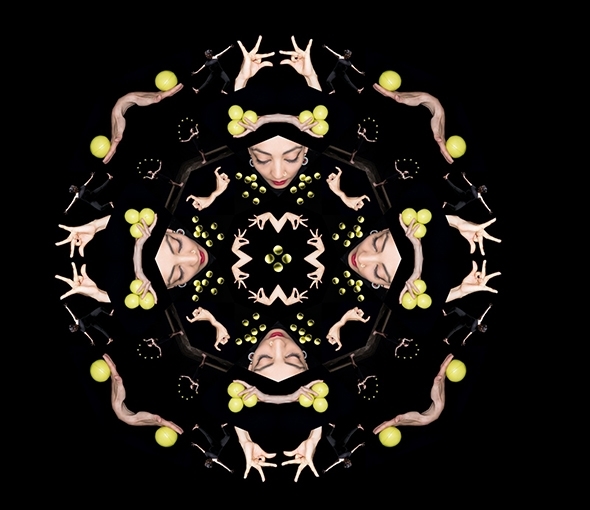 In Sigma, presented at Lilian Baylis Studio as part of the 2018 London International Mime Festival, Sean Gandini, artistic director of Gandini Juggling and Seeta Patel, an accomplished bharatanatyam soloist and choreographer, propose a dialogue — or flirtation as Gandini calls it — between juggling and bharatanatyam. Sigma is the second of three such dialogues Gandini has curated, the first being with classical ballet (4×4 Ephemeral Architectures) and the third, Spring, with contemporary choreography by Alexander Whitley, which will premiere at Cambridge Junction next month. The term ‘sigma’ means ‘sum of small parts’, aptly describing the structure of Gandini’s and Patel’s dialogue that examines aspects of their respective arts from their two distinct perspectives. Clearly nothing much will result from a dialogue where perspectives are too closely aligned, and on the surface there appears to be little in common between juggling and classical Indian dance. The history of juggling suggests it has always been an artistic form on the informal edges of entertainment; while it has developed its own virtuosic routines it has eschewed a formal musical or physical framework for the improvised freedom of the street or circus. By contrast, bharatanatyam has a long history of formalized representation with an improvisational core based on a close relationship with its musicians. In formalizing such a dialogue Gandini and Patel run the risk of either framing juggling too tightly or unframing bharatanatyam, but in their irrepressible curiosity they set out to explore how the geometries and dynamics of their respective arts intersect within their common experience of space and time. By putting the two forms on the same stage, Sigma immediately reveals a formal affinity, a double intricacy of gesture and rhythm that initially sets the dialogue alight. It is in the inordinate physical dexterity, agility and coordination of hand and eye, as well as in the use of complex musical rhythms that the two art forms thrive. Seeing Patel’s refined hand gestures against the juggling hands of Kim Huynh and Kati Ylä Hokkala and to juxtapose the complex rhythms of bouncing balls with Patel’s and Indu Panday’s intricate footwork is to appreciate both arts in a fresh light. There are notable similarities, too, in the use of improvisation (uncommon in the western classical ballet tradition) and in the dynamic tension between concentration and relaxation that allows the performers of both forms to appear at ease as they negotiate demanding routines. Perhaps one of the most interesting developments in Sigma’s dialogue, one in which both art forms find themselves in new territory, is the section ‘Tribute to London’ in which both dance and juggling are performed to the syncopated rhythms of chanted tube station names. There are also some notable disagreements between the two forms: gesture in bharatanatyam is embedded in meaning, whereas in juggling it is a function of the dynamic act. This fundamental difference renders the section in which Patel and Huynh compete in physical expressivity rather flat because there is no standard of comparison. Another disagreement is in a contrasting sense of humour. Humour in juggling is a response both to the inherent illusion and the nonchalant virtuosity of the act. In bharatanatyam humour is embedded in the story that the artist expresses. Sigma carries no story in itself — except in the ethnological, autobiographical framing — so Patel and Panday are roped into Gandini’s sense of humour that appears to be less a result of dialogue than of acquiesence. There is an external element in Sigma that enhances its presentation: the stage setting and Guy Hoare’s atmospheric lighting. What we see as we arrive is a bare stage with two bland, institutional dividers on wheels. As the performance unfolds, so do the screens, revealing mirrors on the hidden side that reflect both the audience and the performers. In the duet between Patel and Huyhn to the aria from Bach’s Goldberg Variations, Panday and Hokkala circle the performers with the mirrored panels, extending the sculptural forms of the choreography to which Hoare’s lighting gives a visual unity even if the full effect is evident only to those sitting in the middle of the stalls. Out of the sum of its many components, however, Sigma fails to create a cohesive whole. The initial exploration throws up ideas like balls and keeps the dialogue afloat, but the joint dynamics fall off, and balls drop as the exchange deconstructs into its constituent soliloquys. At the end illusion peters out with a muted chorus of regrets. Wild Card is a series of specially curated evenings from a new generation of dance makers bringing fresh perspectives to the stage. For each Wild Card, an up-and-coming artist is given the opportunity to present work that excites them alongside their own. Something Then, Something Now is both the title of Seeta Patel’s Wild Card evening and a way of understanding it. The evening is divided into two, with Patel dancing a Bharatanatyam solo to live Carnatic music in the first, and Pushkala Gopal performing a series of Abhinaya — the facial, gestural and character aspects of the Bharatanatyam tradition — with the some of the same Carnatic musicians in the second. In both cases, the compositions originate in the past (between the twelfth and the eighteenth centuries) but the interpretations are very much in the moment. Because both the artist and the art form are inextricably linked, we are not simply watching historical compositions reconstructed for the present: it is the past in the ever-present that makes the evening so rich. 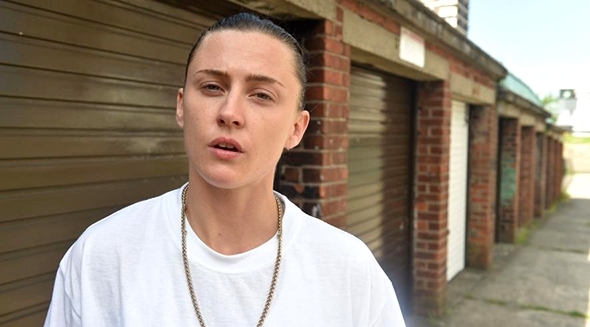 Patel is one of a new generation of dancers who are born in England of Indian parents but she is considered an Indian dancer because she looks Indian and she dances an Indian form. Identity is something Patel has already tackled with playful irony in a short film she made with Kamala Devam, The Art of Defining Me, but for her Wild Card program she sets out to dispel the equally equivocal notion that Indian dance is an exotic, ethnic import. She sees Bharatanatyam as a classical form in the same way, perhaps, that Beethoven’s or Rossini’s music is part of the classical tradition independent of its cultural origin. It is a differentiation that may be lost on those who thrive on compartmentalization but for the two packed houses at her Wild Card program, the freshness of her approach and the quality of her dancing are indisputable. Lighting designer Guy Hoare creates a cocoon of hazy light that engulfs the musicians seated at one side of the stage in the preamble to the performance. The violinist’s sliding fingers, the flautist’s swaying torso, the percussionist’s lightning fingers on the taut skin and the vocalist’s rich voice all prefigure Patel’s dance. Mavin Khoo, who sits with the musicians as conductor and vocal percussionist, half explains, half intones the story of praise and love Patel is about to dance, after which Hoare lowers the lights to prepare us for her entrance: first her hand and then her arm, then her entire body appear through a thin sheet of light. For the next fourty minutes Hoare integrates Patel’s dance and the Carnatic music into an intoxicating drama of mystery and light. The focus of this eighteenth century work from the Raga Anandabhairavi is the relationship between three characters (the heroine, her friend and Lord Krishna) and the dual nature of love and devotion. Patel as the heroine and sole narrator is exquisitely beautiful, dressed in a turquoise costume accented with filigree gold and adorned with jewels that themselves seem to dance in the light. She uses her richly expressive facial features to convey the full spectrum of feeling and emotion and her graceful hand and arm gestures symbolize the motifs and details of her story. Throughout the dance there is a heady sense of improvisation between Patel and the musicians that requires a heightened musicality from both. I don’t want to take my eyes off her, and the musicians never do. Between the narrative sections are the pure dance or rhythmical sections in which she becomes one with the music like a human instrument. Her rapid footwork, darting arm gestures and fast — unbelievably fast — turns are nevertheless clear and fully articulated as if there is a still point within her around which, and from which, everything moves. No wonder Anna Pavlova recognized the parallels between Indian dance and classical ballet. In the second part of the evening, Pushkala Gopal sits authoritatively on a platform surrounded by the same group of Carnatic musicians with Divya Kasturi as an additional vocalist. Abinhaya are performed to explore texts written mostly, Gopal says in her introduction, by men fascinated by heroines in love. Her gestures arrive out of the words and the layers of meaning in the song. As in Patel’s dance, the symbiotic relationship between Gopal and the musicians is exhilarating. The final song is about an Untouchable whose interest in seeing Lord Shiva is so pure that he succeeds against all odds in achieving his goal. It is appropriate that such a story should conclude the evening in which Patel has put her talent and passion at the service of an art form she wants to champion in this country. Patel is, to our eyes, an accomplished dancer but in the timeline of her art she can be seen as just a beginner, as Khoo — her teacher — pointed out in the post-show talk. It is lifelong artistic investment that lies at the heart of classical art, but with a public funding system that cannot look with confidence beyond the five-year political cycle there seems little hope of an enduring solution. Great art for all requires great artists, and great artists can’t mature on a fast-food project basis. But if an untouchable can see Lord Shiva then we can look forward to enjoying Patel’s long-term development in her chosen art.